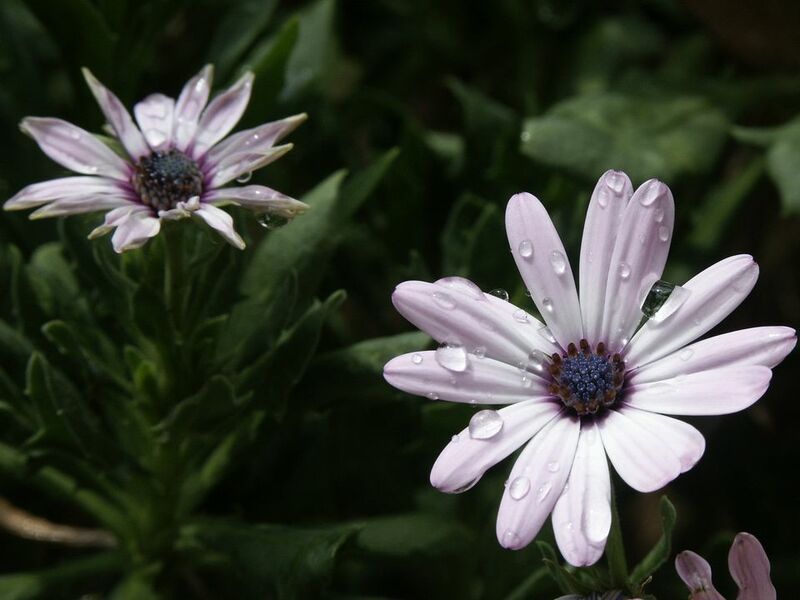 Osteospermum, or African daisies, have flowers that look very familiar, yet totally foreign. You may even think they've been dyed or painted. African daisies look a lot like common daisies, with petals radiating around a center disk. They are even in the Asteraceae family, along with Shasta daisies and zinnia. But when African daisies were first introduced to the market, they had vivid coloring many weren't used to seeing. The flower's center disks looked as though they are colored with metallic paint. African daisies are definitely unique. The leaves will vary by variety. They can be lance-like or broadly ovate and smooth, toothed or lobed. Petals can be smooth and flat, like a daisy, or radiate out in a tubular, spoon-shape. Plant Type: African daisies are often labeled as tender perennials or half-hardy perennials. African daisies are generally grown as annuals. Mature Size: 12 to 36 inches high and 12 to 24 inches wide. The actual size will depend on the variety you are growing and the growing conditions that year. Sun Exposure: Full sun. Since they are cool-season bloomers, they appreciate some shade in hot weather. African daisies work equally well in the garden or in containers. Because they can stop blooming during hot spells, they are best planted in combination with other plants that will pick up the slack during hot spells. The funky colors can be hard to combine with other flowers. Pairing them with complementary foliage is a great way to incorporate them and guarantee there will be color, even when the plants are not in bloom. Yellow and chartreuse foliage allows most of African daisy color combinations to shine. Heuchera like "Key Lime Pie," Golden Japanese Forest Grass, and Coleus "The Line" all provide a vivid backdrop as well as a textural difference. For varieties with blue centers, like "Soprano White," pairing them with blue flowers like salvia and Veronica, will highlight their striking centers. Osteospermum "Passion Mix," a 1999 All America Selection, was bred to be more heat tolerant and it can handle heat better than most other varieties. It is also a compact plant topping out at about 12 inches high. The flowers come in a wide variety of colors (pink, purple, rose, and white), all with blue centers, and it can be grown from seed. African daisies like bright light. The blooms close up at night and don't open during cloudy or overcast weather. If you are planning on planting them and want to enjoy the blooms at night, you might want to consider another flower. African daisy cultivars prefer cooler weather and they really don't like the combination of hot and dry. During periods of drought, be prepared for the plants to gradually cease blooming and go dormant. Cut them back and keep them watered. They should resume blooming in the fall. When grown as an annual, African daisies needs some supplemental fertilizer every 2 to 3 weeks, especially when grown in a container. Deadheading the spent flowers isn't crucial since many plants are sterile and don't produce any seed; it will keep the plants looking tidy. The majority of African daisy varieties are hybrids and will not grow true from saved seed. Many plants are even sterile. You can find seed for sale and if you are not concerned about what colors your plants turn out to be, you can try sowing the seeds you save. African daisy seeds need light to germinate, so just sprinkle the seeds on top of the soil and press lightly, to make firm contact. Keep the seeds moist until they germinate. African daisies can easily be reproduced by cuttings. 3D: Known for fluffy, tufted centers, these flowers that remain open all day, even in hot weather. They grow up to 14 inches high. Flower Power Spider White: These have odd, spoon-shaped white and lavender petals with a gold center. The plants grow up to 14 inches high. Lemon Symphony: The butter-yellow petals have a purple center and orange eye; can grow up to 14 inches high. Sideshow Copper Apricot: Striking pale apricot flowers have a purple center disk; they grow up to 12 inches high. Disease: Gray mold can develop in damp or humid conditions. Good air circulation will help and a general purpose fungicide can be used, if necessary. Plants are also susceptible to root rot in wet soil. Insects: Whitefly and aphids can become a problem, but can be controlled if caught early. Animals: By far the biggest problem is groundhogs. They will devour the entire plant.